Now you can enjoy all the benefits of your SLFCU Visa Signature® credit card, Visa Platinum® credit card, or Mastercard® debit card using Apple Pay on Apple® devices. Apple Pay changes how you pay with contactless payment technology and unique security features built right into your device. So you can pay in an easy, secure, and private way. To add your SLFCU card to Apple Pay, use your phone's camera to capture your card information, enter it manually, or just add your SLFCU card from your iTunes® account to Apple Pay. To pay in stores, just hold your device near the contactless reader with your finger on Touch ID®. A subtle vibration or sound lets you know your payment information was successfully sent. You may be asked to enter a PIN at some merchants. To pay within apps, checking out is as easy as selecting the Apple Pay button and placing your finger on Touch ID. When you pay with your SLFCU card using Apple Pay, you still get all the rewards, benefits, and security that comes with your credit or debit card. 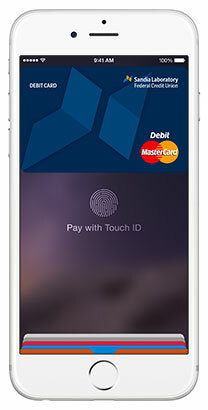 To learn more about the security of Apple Pay, a list of stores and apps that accept Apple Pay, and how to add a card, visit www.apple.com/apple-pay. Apple, the Apple logo, iTunes, and Touch ID are trademarks of Apple Inc, registered in the U.S. and other countries.